You are worth the timeit takes me to choose a card, inscribe it, address the envelope and send it on its (dare I say, “merry”) way to you. This pre-Christmas post is appearing so early because many of us are already addressing our Christmas greetings during the Advent season. And so it goes that Christmas cards and paraphernalia will soon usurp the place of other products in our local stores. Whether you purchase your cards each winter, or wait until those amazing after-Christmas sales to buy them at 70% off, please keep this advice from C.S. Lewis in mind when you choose them. Send cards that are appropriate for your recipients. As a rule, if you are a Christian, you should send a card that celebrates the true meaningof the holy day. Naturally, this can be waived if it would cause genuine offense. However, if someone genuinely practices a different faith, why would you send them a Christmas card in the first place? A Hanukkah card, or a secular New Year’s Day or Thanksgiving seasonal missive would probably be more appropriate. What I would encourage you to avoid sending during this time when we focus on the Incarnation miracle, is the sort of pastoral scenes with their innocuous tidings. For example, the happily sleighing family traveling in a conveyance very few of us will ever see. Send them at some other time, if you will, but they have little or nothing to do with the Nativity. Now it’s fine if you think I’m old fashioned like the dinosaurs we recently considered. But if you dismiss my opinion, please consider that of C.S. Lewis. Lewis’ opinions about the commercialization of the Christmas season are well known, and we have discussed them here at Mere Inkling in the past. He, of course, abhorred the secularization of a sacred event. How sad he would be today to witness how Santa has continued to supplant Jesus. Some will point out that Lewis himself included Father Christmas in his Chronicles of Narnia. This is true, but it is distinct from the modern secular excesses. In The Lion, the Witch and the Wardrobe, Father Christmas more closely resembles Saint Nicholas, in giving gifts and proclaiming the arrival of the King. It’s not accidental that he begins and ends his visit with the children by pointing to Aslan. “I’ve come at last,” said he. “She has kept me out for a long time, but I have got in at last. Aslan is on the move. The Witch’s magic is weakening. . . .” Then he cried out, “Merry Christmas! Long live the true King!” and cracked his whip, and he and the reindeer and the sledge and all were out of sight before anyone realized that they had started. C.S. Lewis was a truly devoted correspondent. He wrote back to the many fans who sought him out, and offered thoughtful responses to even the most frivolous queries. The writing was burdensome, and only the assistance of his brother Warnie for many years kept him from being forced to cease his generous practice. Some of his correspondents were, or became, his friends. In December of 1955, he thanked one of these for the Christmas card he had sent. The friend was Peter Milward, a Jesuit priest. Lewis’ comments are still timely for Christian readers today. Thank you for y[ou]r letter of Nov. 17. The enclosed card was one of the v[ery] few I have been pleased at getting. Christmas cards in general and the whole vast commercial drive called ‘Xmas’ are one of my pet abominations: I wish they could die away and leave the Christian feast unentangled. Not of course that even secular festivities are, on their own level, an evil: but the laboured and organised jollity of this—the spurious childlikeness—the half-hearted and sometimes rather profane attempts to keep up some superficial connection with the Nativity—are disgusting. But your card is most interesting as an application of Japanese style to a Christian subject: and, me judice [in my opinion] extremely successful. I hope you will reflect on Lewis’ thoughts on this subject. Christmas is too precious a time to be “entangled” with secular and pagan baggage. If you send any holiday communiques—even of a digital nature—choose them wisely. Upon Lewis’ death, Walter Hooper assisted Inkling Owen Barfield (1898-1997) in overseeing Lewis’ literary estate. He continues to serve as a literary advisor to the estate. Hooper’s Lewisian contributions have grown in magnitude over the years. He began by co-authoring a biography of Lewis in 1974, written jointly with Roger Lancelyn Green (1918-87). Green had been a student of Lewis, and a member of the Inklings. After writing several other works through the years, in the late nineties he penned C.S. Lewis: A Companion and Guide and C.S. Lewis: A Complete Guide to His Life and Works. Priceless resources! Hooper’s meeting with Lewis was providential, coming as it did so near the end of the great author’s life. The following letter describes their arrangement. It reveals how much Lewis appreciated the initial assistance provided by Hooper, and how hopeful he was that Hooper would be able to resume his secretarial duties in the summer of 1963. Lewis remained, however, concerned about how he would meet all of his financial responsibilities in the wake of his medical retirement. We get on reasonably well, tho’ we all greatly miss, not only your utility, but your companionship. No one has ever so endeared himself to the whole household. The noble Arthurian volumes continue to arrive, but are not yet on the shelves. The work of arranging all my books in their new homes, tho’ delightful, goes on v[ery] slowly, for I am not strong enough to do more than a little each day. Now, about the future. It is entirely reasonable that you shd have a salary and a darn good one, and I feel I have been rather sponging on your kindness. But what it may be proper for you to ask may also be impossible for me to do. I dare not at present increase my expenses. In this country one is taxed each year on the income of the previous year. One’s first year in retirement is therefore very alarming. And if, on top of the drop in income, there are the expenses of an illness, and some rather heavy and unexpected expenses for David–well you see. I am v. ashamed, not of confessing the situation, but of refusing the wholly just demand from a man to whom I already owe more than any money could repay. But you see, having you as a paid secretary wd. be a luxury, and I’ve no right to imperil those who depend on me for the sake of a luxury to myself. On other grounds, I couldn’t recommend you to come in January. Mrs Miller and I talked it over and both concluded that an English house in an English winter wd. be misery for you. Our central-heating apparatus is v. primitive (nothing like yours) and we can afford to use it only during very cold snaps. If you can afford to come in June, you will be thrice welcome. W. is still away. I fear he’ll kill himself if this goes on much longer. Walter Hooper has been very content to remain behind the scene, and deep in the shadow of the man whose memory he preserves. Fortunately, in addition to his personal writings and editorial work, Hooper has been willing to speak in various settings. The photograph at the top of the page comes from the unveiling of Lewis’ memorial in Westminster Abbey’s Poets’ Corner. We owe a debt of gratitude to “Socrates in the City: Conversations on the Examined Life,” which is produced by Eric Metaxas, a Christian writer and syndicated radio host. Metaxas took his program from the city of New York, to the city of Oxford to avail himself of the wealth of brilliant speakers accessible there. Among those he interviewed in this casual setting is Walter Hooper. Wonderfully, the Hooper interview was substantial enough that it is presented in three parts. Do check it out. C.S. Lewis’ prolific, genre-crossing success teaches us two things. First, that a very good writer can fruitfully write in a variety of fields. Second, that even the most gifted of authors cannot write with equal talent in all genres. Students of C.S. Lewis are well acquainted with the fact that one of the great disappointments of his life was failing to succeed as a poet. Although he did write a reasonable amount of poetry, it failed to elicit the response for which he hoped. Lewis did, of course, receive well-deserved kudos for his literary fiction and children’s stories. His fiction and nonfiction are extraordinary, and over the years I have appreciated the value of his many essays to be among the most precious of his works. Finally, as a correspondent, Lewis stood in the first ranks. He regarded the responsibility of personally responding to the letters he received as something not to be shirked. Fortunately, the excellent collections of his letters offer us many insights into Lewis’ life and career. For his Christian fans, they reveal insights into how a disciple of Jesus can gracefully navigate life. The following letter was written in 1959, to a man who was apparently the editor of a small newspaper. He had requested an article from the exceedingly busy professor. Lewis’ response is quite interesting. Yes! my handwriting is awful. It used to be nice but my muscles have stiffened up and the strokes no longer come out as I intend. I give ‘this generation’ all I can in the way of books and articles. Particular articles by request are not usually the good ones: and, you know, I should reach more readers through other organs than your paper. I hope this doesn’t sound stand-offish or conceited, for it is not meant to be. It is really common sense to speak where one can be most widely heard. I agree that drama is a good medium for our purpose. In this country Dorothy Sayers’ broadcast set of plays on the life and death of Our Lord (The Man Born to be King) did a great deal of good. I don’t attempt this form myself because any talent I may have is narrative, not dramatic. With all good wishes. I draw several observations from reading this letter. Lewis took the time to personally pen many of his letters, despite the fact that this presented an uncomfortable challenge to him. Lewis preferred to address subjects as he felt moved by the Holy Spirit to do so, rather than on demand. He did not have the time to dress it up in gentle fluff, but candidly expressed the fact that if he had sufficient time and energy to write, it would not be the wisest stewardship to send the piece to a publication with a limited distribution. Even though he did not intend for that remark to be curt or “conceited,” Lewis still felt compelled to offer his “I hope this doesn’t sound…” apology. Lewis appreciated drama, and recognized Sayers’ work as quite noteworthy. He recognized that drama would not be his forte, and wisely preferred to stick with the type of writing wherein he was most accomplished. Even this final thought is offered with C.S. Lewis’ characteristic—and genuine—humility. I don’t attempt this form myself because any talent I may have is narrative, not dramatic. As a writer myself, I find this sentence quite comforting. And not simply because my own extremely modest talents also lie in the narrative realm. Even if I were a poet or a dramatist I would recognize how liberating it is to acknowledge that one cannot be fairly expected to excel at more than one genre. Ultimately, whether we consider ourselves to be adequate or exceptional writers, it is necessary to understand where our skills reside, and to transgress those boundaries only with the greatest trepidation. Sometimes authors are not quite so brilliant as we think them to be. It is possible to read into someone’s work ideas, and even profundity, that was not present when they were originally composed. That’s an odd thought, I will admit. But the truth is that each of us as readers carry with us our own knowledge and personalities. Imposing those upon a text is a subconscious reality, and it may even be unavoidable. Minimizing our presuppositions is one of the key elements of honest literary criticism. This is one of the reasons that it is insanity to impose contemporary “political correctness” on writers who lived before such constraints were imposed. Intelligent people recognize that we must read Twain as an iconoclastic nineteenth century author, and Bunyan as a Baptist preacher of the seventeenth. I just read a letter in which C.S. Lewis describes how this works. He wrote to a Roman Catholic correspondent, a priest, on Christmas Day 1959. In the letter he responds to his friend’s reference to something he had not consciously included in a particular book. It is a fascinating letter, and even though it is the final portion that pertains to the subject I’ve been discussing, I will share it in whole. I hope my last letter to you did not sound chilling: still less (heaven help us!) as if I were offended by criticism. I think the chief reason why I am less disposed than you for large-scale discussion by letter is the difference of our ages. In youth we conduct (at least I did) long and deep disputations through the post. It is indeed a most valuable part of our education. We put into it quite as much thought and labour as would go to writing a book. But later, when one has become a writer of books, it is hard to keep it up. One can’t fill one’s leisure with the v. same activity which is one’s main work. And in my case not only the mind but the hand needs rest. Penmanship is increasingly laborious, and the results (as you see) increasingly illegible! If you sometimes read into my books what I did not know I had put there, neither of us need be surprised, for greater readers have doubtless done the same to far greater authors. Shakespeare would, I suspect, read with astonishment what Goethe, Coleridge, Bradley and Wilson Knight have found in him! Perhaps a book ought to have more meanings than the writer intends? But then the writer will not necessarily be the best person with whom to discuss them. You are in my daily prayers. Will you pray much for me at present? The cancer from which my wife was (as I believe, miraculously) delivered 2½ years ago, when death in a few weeks was predicted, is returning. Can one without presumption ever ask for a second miracle? The prophet turned back the shadow for Hezekiah once: not twice. Lazarus, raised from the dead, presently died again. P.S. I never thought of it before, but how Lazarus was sacrificed. To have it all to do over again–bis Stygios innare lacus! Father Peter Milward, SJ, taught English Literature at Sophia University in Tokyo. He has extensively published on his major subject, and A Challenge to C.S. Lewis (1995), which I just now ordered for my library. A curious title, however, for a student and “fan” of Lewis. As a Shakespeare scholar, he has persuasively argued that the bard was Roman Catholic. “When the archbishop of Canterbury recently broke his church’s long silence and acknowledged that William Shakespeare was probably a Catholic, it was a moment of quiet satisfaction for Father Peter Milward, the author who began researching this subject a half century ago.” Read the article here. How precious is a single letter? If it is eagerly anticipated correspondence from a close friend or loved one, it may be invaluable. Telephones and email have diminished the impact offered by the contents of an individual message, yet even now we value the touch of the written word shared by our soul mates across the miles. Prior to the invention of the internet, and before the cost of international calls grew reasonable, I spent a year in the Republic of Korea, far from my wife and three young children. Naturally, like all military members serving far from home—even during times of peace—I missed them terribly. While many wonderful things happened during the course of that year, and lifelong friendships were born, the highlight of each day was a visit to the installation post office. And, due to the faithfulness of my mother, sister and wife, I was greeted nearly every day by one or more handwritten messages of love and encouragement. So important were these bonds that, prior to my departure, Delores and I covenanted to write one another every single day. A promise we both kept. In addition, I promised to write each of my three children their own letter each week. One evidence of the impact of those letters was the seamless reunion our family experienced when I returned after a year away. In the even more distant past, this means of communication was even more vital. As little as a century ago, when individuals and families emigrated from their homelands they recognized the sad truth that they would probably never see their loved ones again. Think about that for a moment. Saying “goodbye” usually meant “I will never see you again in this life.” How precious those missives must have been when they found their way between intimate companions! Eighty-five years ago, C.S. Lewis was carrying on an active correspondence with the dearest friend from his youth, Arthur Greeves. In the 1930s, the two men were corresponding on a weekly basis. Lewis opened one of his letters with the following paragraph to gently reprimand Greeves for allowing other responsibilities to delay his writing. Your letters get later and later every week. If you write on Monday the first week, on Tuesday the second week, and so on, then in seven weeks you will be writing on Monday again: but you will have written one letter less than you should. In a year you will have written eight letters less, that is thirty six pages. Assuming that we both live thirty years more you will in that time have cheated me out of one thousand and eighty pages. Why, oh why, do you do these things? As I said, the “reprimand” is gentle, even humorous, but it is sincere. It reveals just how meaningful each piece of his friend’s correspondence was to Lewis. Many of us can relate to Lewis’ experience. We know firsthand how a smile comes to our lips and our pulse quickens when we find a message from a close companion. I wanted to share this thought with each of you today for two reasons. First, I thought it might remind you of those whose words have encouraged and supported you in the past. My second motivation is more important. I would like to suggest that you pause to consider just how important your letters are to others. There are thousands of reasons for not scheduling (and guarding) time to write letters. Life is busy. The distractions vying for our attention are certainly more numerous, and loud, than they were in decades past. Still, reminded of the value of the gift we offer when we write, perhaps it is time to shuffle our priorities. 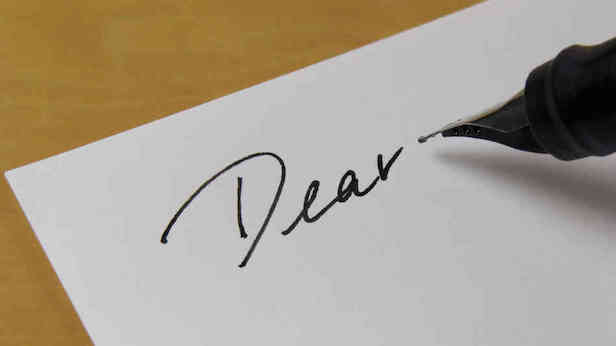 How many letters have you read that were penned in the tradition of C.S. Lewis’ groundbreaking Screwtape Letters? If you’re a fan of the collection, you’ve probably read similar correspondence that owed its very existence to Lewis’ work. Now a more sensitive question—have you ever written anything similar to The Screwtape Letters? I must confess that I have. In fact, I’m currently working on a similar collection I hope to finish during the coming year. Many writers have tried their hand at writing angelic letters, with varying degrees of skill and success. After you finish this column, you might want to check out two examples right here at Mere Inkling: Screwtape Letters Anniversary and Screwtape Goes to War. Some letters have been composed from the perspective of a heavenly angel (often perceived of as a “guardian” angel). Others have been, like Lewis’ innovative example, written from a diabolical angle. Demons, we recognize, have been cast out of the heavens for which they were created, but they still remain angels, albeit fallen angels. One of the lures that motivates those who emulate the Screwtape Letters is found in C.S. Lewis’ statement that they were rather easy to compose, once he had undergone the uncomfortable process of placing himself in the mind of an enemy of God. It is disorienting, to reverse reality. For example, to hate what God loves (i.e. his creation, and especially humanity). And it is this discomfort that Lewis alludes to in describing his reluctance to pursue the genre any further than he did. For writers, copyrights are precious. It is good news, unknown to many, that current law (at least in the United States) protects everything we write. As soon as it is created (the words are arranged in their unique order), our work is protected by copyright whether or not we use the © symbol. There was a bit of a scandal a few years after Lewis wrote The Screwtape Letters. Well, “scandal” is too serious a word. More like an awkward and uncertain moment, when an American journalist wrote a book that was clearly inspired by Lewis. 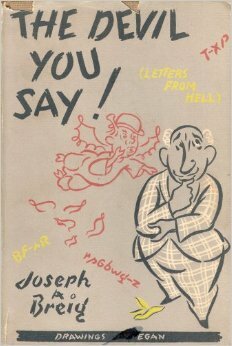 I’ve only recently received my copy of The Devil You Say by Joseph A. Breig. It was published in 1952, and the introduction echoes Lewis’ own. While the letters themselves appear to be independent of Lewis, I suspect the following parallel from the two prefaces shocked Lewis when he saw it. Following its publication, one of Lewis’ correspondents, Idrisyn Oliver Evans, sent him a copy. Lewis’ response follows. I cannot find any record of whether or not Macmillan challenged the publication of the new volume. Lewis had no objection to another writer developing his idea about devilish correspondence in their own creative direction. He simply desired to ensure his own work was not usurped. Before ending, I would not want to leave a negative impression about Mr. Breig. In looking further into the work, one sees just how little resemblance it bears to The Screwtape Letters. It clearly is not plagiaristic. In fact, it’s quite possible that the line cited above was actually intended to be an homage to Lewis. It turns out that Joseph Anthony Breig (1905-1982) was an accomplished and well respected Roman Catholic journalist. Breig stayed at the Universe Bulletin until his retirement in March 1975. He continued to write his columns after 1975. They appeared not only in the Universe Bulletin but also in several other Catholic newspapers in the USA. Besides being a newspaper writer, Breig also wrote for many magazines (Ave Maria, Our Lady’s Digest, The Family Digest, Crozier, and others) and published eight books and several short stories and plays. In honor of his work he received two honorary doctorates (St. Vincent College, Latrobe, Pennsylvania, 1954, and Carroll College, Helena, Montana, 1967). He also won several awards, one of which was the St. Francis de Sales Award from the Catholic Press Association in 1966. (The Book of Catholic Authors). I’ll close with a final quotation from the same biographical source. When writers gaze at a blank sheet of paper they see many things. Some see it as naked canvas, and others as a challenge. I enjoyed the compliment offered by one of Breig’s editors, who praised his prolific literary production.